If you’ve been following the blog, you might have noticed, that I’ve started to pay attention as to how the world economy actually works, and it’s scared me a bit. It’s not because we personally are in trouble, or if we are we haven’t noticed; after all we’ve just gone a bought a car. it’s because once you see any of this information you can’t but fail to see how the global economy appears to be built on a fundamentally flawed ideal, that we will never run out of stuff. 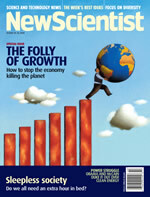 Well today I’ve fulled my paranoia even more, I’ve been reading New Scientist, and their special report on how our economy is killing the earth. so of the articles are available on line, but it you’ve got access to it, I recommend you read the New Scientist this week. for those of you with no time/inclination/regard for the fate of the world, here is my summary. We’re all doomed, because the way the entire planet works is based on the fact we are never expecting to run out of resources. Just to make that clear, when we run out of oil, or fish, or water, or coal – the free market will collapse, because it’s all driven by the fact that it needs to grow to feed itself. stop the economy - buy this! some of the ideas to solve these problems are a bit Utopian, but we do need to do something, persuading people to forgo material riches, and start placing values on society isn’t going to be an easy thing. I’m not even sure there are any real individual things you can do today (short of starting a revolution) to change this. everyone in any position of power has so much vested in the system they’re not going to change easily.